In Latvian terms, Toronto and the surrounding area is big. Even almost 15 years after the restoration of Latvia’s independence and the downsizing evident in so many communities in the Latvian diaspora, the size and activity of the Toronto community is impressive. Check out the events calendar in Toronto Ziņas (www.torontozinas.com) and there will hardly be a weekend when a special event isn’t happening. Then there’s the stuff you don’t see. Life in the Toronto Latvian community revolves around “Centrs,” or the Latvian Canadian Cultural Centre as it is officially called. Centrs is a sprawling complex purchased in 1979 for more than CAD 6 million and is the largest such Latvian facility in the West. It houses one of the largest Latvian libraries outside of Latvia, a children’s library, a playground, a book store, the Toronto Latvian Credit Union (with assets of more than CAD 39 million), classrooms, rooms for use by scouts and guides, a restaurant and bar called Umurkumurs (serving beer from Latvia), a number of Latvian fraternity and sorority rooms, offices of the Latvian National Federation in Canada, and—since the older and much smaller Daugavas Vanagu house was sold—offices of the weekly newspaper Latvija Amerikā and the veterans and relief organization Daugavas Vanagi. Chef Ingo Karkliņš heads acclaimed catering crew. They prepare food for the many Latvian and non-Latvian individuals and groups who rent facilities at the centre. Sunday morning brunches are popular throughout the fall and winter season. Attendance rarely dips below 100. The large hall at Centrs can hold more than 300 people and has hosted many a Latvian politician since the Third Awakening in Latvia, as well as banquets for presidents Guntis Ulmanis and Vaira Vīķe-Freiberga, who lived and studied in Toronto before moving to Montreal. The fate of the older Latviešu Nams (Latvian House) in downtown Toronto is still up in the air and could be sold. It is home to one of two Latvian pensioner groups and the Toronto Latvian High School. Four Latvian congregations can be found in Toronto, five if you count the Dievturi, followers of pre-Christian Latvian mythology. The two largest congregations are the Lutheran St. John’s and St. Andrew’s parishes, each with approximately 1,000 members. The much smaller Austrumu parish has less than 200 members. The Catholic congregation is even smaller. St. John’s is served by Dean Fritz Kristbergs. He is helped by the Rev. Anita Gaide, who also serves the Austrumu congregation. The Rev. Ilze Kuplena-Ewart is resident at St. Andrew’s. Both St. John’s and St. Andrew’s congregations have their own churches. St. John’s church is modernist and located in a prestigious residential area of mid-Toronto. St. Andrew’s shares a historic church in downtown Toronto with an Estonian congregation. All four congregations have country properties. The two largest are Sidrabene (St. Andrew’s), near Milton 45 minutes west of Toronto, and Saulaine (St. John’s), near Barrie an hour north of Toronto. Both host summer camps for children and are home to dozens of cottagers. Some live in Saulaine year round. The Austrumu congregation has a smaller property, Tālava, near Saulaine, while the Catholics head up to Mežciems farther north near Bracebridge. Come Jāņi, the midsummer festival, many Toronto-area Latvians head to these properties to celebrate. Three Latvian heritage language schools operate in Toronto. Two of them are elementary schools. The Toronto Latvian School Valodiņa holds classes on Friday nights while the Toronto Latvian Society Saturday School (known just as Sestdienas skola) convenes, of course, on Saturday mornings. Although the numbers are down and Latvian language skills are weaker than in earlier years, between the two they have more than 100 students. Both use facilities at the Latvian Canadian Cultural Centre. The Toronto Latvian Folk High School with 30 students meets on Friday nights at Latviešu Nams. On the cultural scene, the Toronto Latvian community includes the Toronto Latviešu Biedrība, the artists’ collective LATVIS, the artisans “Daiļamatnieku savienība,” and the folk dance groups Diždancis, led for many years by Zigurds Miezītis, and Daugaviņa, as well as the offshoots Dižais Dancis for older dancers and Mēnestiņš. Choirs include Dzirksts, directed by Vizma Maksiņa; Zīle, directed by Arvīds Purvs directing; ensembles from St. John’s and St. Andrew’s churches, and Daugavas Vanagi men’s choir. The Toronto Latvian Concert Association has for many years offered classical concerts which in recent years have featured artists from Latvia. Notable Toronto area writers, all women, include Indra Gubiņa, Ingrīda Vīksne, Velta Toma and Aina Zemdega. Linda Maruta Kronbergs and Maia Ķuze are visible in the local contemporary music scene. 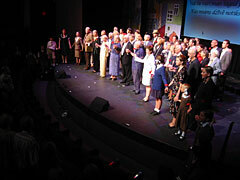 Toronto has been home to all 12 Canadian Latvian Song Festivals. The first one was held in 1953 while the most recent one was held in 2004 and included the debut of “Eslingena,” a popular musical set in a post-war Displaced Persons camp. A large portion of the cast was from the Toronto area. The next song festival in 2008 however, will be held in Hamilton, 70 kilometers southwest of Toronto. In earlier years, the Latvian community participated in Caravan, hosting a pavilion in the heyday of this popular multicultural festival. In a rural setting near Woodbridge is Kristus Dārzs, an old age home and long-term care facility with 100 beds. Most residents are Latvian but the facility has had difficulty filling staff positions with Latvians. Canadian immigration and labour laws have prevented Kristus Dārzs from bringing qualified staff from Latvia. Toronto area Latvians who have gained wider prominence in Canada include composer Tālivaldis Keniņš; pianist Arturs Ozoliņš; Olgerts Kupcis, former president of Ontario Hydro, one of the largest public utility companies in the world; E. N. Legdziņš, chief operating officer of First Canadian Funds; Brunis Rubess, former president of Volkswagen Canada; Georgs Benjamins, founder of the now defunct Benjamin Film Labs; Rhodes scholars Baņuta Rubesa and Zinta Zommere; hockey author Andrew Podnieks; landscape photographer Jānis Kraulis; Ivars Tauriņš, founder and director of Tafelmusik Chamber Choir; music critic John Tērauds; freelance writers Kaspars Dzegūze and Māra Gulēns (also editor of Toronto Ziņas), and radio news commentator Dzintars Cers. The numerous Latvian professors in Toronto-area universities include Rhodes scholar and historian Modris Ekšteins. He is the author of the critically acclaimed books Rites of Spring: The Great War and the Birth of the Modern Age and Walking Since Daybreak: A Story of Eastern Europe, World War II and the Birth of the Modern Age. In 1997, lawyer Sarmīte Bulte was the first Latvian elected to Canada’s House of Commons as a Liberal member of Parliament for the Toronto riding of Parkdale–High Park. She was re-elected in 2000 and 2004 but was defeated in the January 2006 federal elections as the Liberal Party lost power to the Conservatives. A high profile woman in the Liberal Caucus, Sam, as she is known by her colleagues, was parliamentary secretary to both the Minister of Industry (for Women Entrepreneurs) and the Minister of Canadian Heritage as well as the chair of the Ontario Liberal Caucus. On the culinary scene, entrepreneur Ojārs Kness-Knezinskis is owner of Ein-Stein, a popular downtown pub catering to University of Toronto students. It is a popular hangout for younger Latvians. Andris Grīnbergs is the current owner of Kristapsons. His smoked salmon is rated highly by local food critics. Toronto resident Mārtiņš Vagners runs what is arguably Canada’s smallest winery, Dom Vagners, as a hobby. It is located in one of Ontario’s wine-producing regions near the town of Niagara-on-the-Lake. The bulk of Latvians in Canada and the Toronto area arrived from Displaced Person camps in Germany after World War II. The 1941 census lists 975 Canadians of Latvian descent. Toronto was home of Honourary Consul R.N. Bryson, who hosted Latvian Independence Day ceremonies attended by a handful of so-called “Old Latvian” families who had emigrated from Latvia prior to the war. They helped the first post-war “DPs” settle in. By 2001, according to Statistics Canada, the number of Latvians in Canada was 22,615 (including 13,730 who listed multiple ethnic backgrounds) although only 4,750 listed Latvian as the language spoken most commonly at home. Of those, 14,575 lived in Ontario and 7,870 were concentrated in the Greater Toronto Area or Metropolitan Toronto with another 570 in nearby Oshawa. An additional 1,230 lived in Hamilton, the second largest Latvian community in Canada, whose members often attend Toronto events less than an hour’s drive away. The next largest Latvian community in Ontario is in Canada’s capital city, Ottawa, with 835 Latvians living 450 kilometers northeast of Toronto. Congregations in both communities own churches and the Hamilton Latvian Society has a Latvian House. Smaller Latvian communities in southern Ontario include Kitchener-Waterloo, London and St. Catherines, but their numbers are shrinking. Most post-war Latvian refugees arrived in Canada by ship in Halifax at Pier 21, Canada’s Ellis Island. Most then traveled by train to Ontario where they were contracted as farm labourers, household servants, lumberjacks and hospital workers. Others went to northern Ontario and Québec mining communities in Rouyn-Noranda, Timmins, Kapuskasing and mill towns Thunder Bay, Sault Ste. Marie and Sudbury. After completing their contracts, many moved to Toronto where a number found construction jobs in its booming economy. Toronto continued to attract Latvian immigrants from Europe well into the late 1950s. Some migrated from Montréal in the 1960s as separatist sentiment and violence in Québec left many uneasy. The foundations of the Latvian community in Toronto were laid in the 1950s as congregations and various organizations were established. The community boomed, the immigrants bought houses, gained a measure of affluence and their children, a new generation of post-war émigré baby boomers grew up swelling the ranks of Latvian schools, summer camps and confirmation classes. In the mid- to late-1970s the peace and quiet of the Toronto community was shattered by the so-called “kultūras sakaru” question. A younger group of professionals challenged the “better dead than red” mentality of the establishment led by the Daugavas Vanagi and the Latvian National Federation in Canada (Latviešu nacionālā apvienība Kanādā, or LNAK), which was headed by its long-term president Tālivaldis Kronbergs. They started traveling to Soviet-occupied Latvia and maneuvered around the KGB to open up links with Latvia’s cultural intelligentsia. Five Toronto area activists led by Guntis Liepiņš formed Dardedze. They hosted artists and musicians from Latvia and showed films produced in Latvia. The ensuing battles were fierce and included vitriolic attacks in the Latvian media, anonymous middle-of-the-night telephone calls and heated debates in public forums and fraternal organizations. The schism sparked the creation of the Latvian Arts Trust Society (LATS), which sponsored alternative cultural programs, and the Toronto Latvian School Valodiņa, which provided an alternative to Sestdienas skola, whose teaching and curriculum at that time were rooted in pre-war Latvia. Unlike other Latvian colonies, Toronto’s was big enough to support what almost amounted to two communities. The wars carried on with the establishment of the Latvian Canadian Cultural Centre. The need to find an alternative to the cramped quarters of the Latvian House was identified by LNAK as early as 1974. The new initiative was headed by Valdis Liepiņš and others who were either active kultūras sakarnieki or sympathetic to them. As a result, the move by the community to spacious quarters for many took on ideological undertones. Latvia’s Third Awakening in the late 1980s interrupted Toronto’s tribal feuds as attention shifted to the homeland and supporting the restoration of Latvia’s independence. Ironically, both sides played a key role and ended up working together. The LNAK under its political leaders Tālivaldis Kronbergs, Linards Lukss, Pēteris Vasariņš and Elma Mināte had cultivated political contacts in Ottawa, ensuring that the government of Canada continued to refuse to recognize the illegal occupation of Latvia by the Soviet Union. In the mid-1980s, their campaign shifted to human rights and the observation of the Helsinki Accords. By the late 1980s a new generation of post-war activists and successful, media-savvy and politically connected professionals took over. They included Guntis Siliņš, Alberts Upeslācis, Viesturs Zariņš (author of this article), Jānis Eichmanis, Pēteris Brauns in Ottawa and Roberts Dambergs in Halifax. They worked the media and ensured that doors in Ottawa and provincial capitals were kept open. Most worked closely with Valdis Liepiņš, Voldemārs Gulēns and other kultūras sakarnieķi who founded the Toronto support group for the Latvian Popular Front (Latvijas Tautas fronte, or LTF) and had built up close contacts with Latvia’s cultural figures and intelligentsia who had moved into leadership positions in the drive for independence. In April 1989 the Toronto support group sponsored and organized a three-day summit on the shores of the frozen St. Lawrence River in Gananoque, three hours east of Toronto. It was attended by 23 leaders of the LTF from Latvia and 100 activists from North America, including several from LNAK. The summit hammered out further Popular Front strategies and solidified support from groups in North America. It paved the path for a series of high-level visits from the provisional leadership in Latvia to Canada and meetings with the Canadian government and media. On January 22, 2001, a day after Soviet OMON troops attacked the Ministry of the Interior in Rīga and killed five, Latvian Vice President Dainis Ivāns, who happened to be in Washington, D.C., was flown into Ottawa and, accompanied by LNAK President Siliņš and political advisor Eichmanis, attended high-level meetings with Canadian government officials. That night Canada’s parliament called an emergency session on the Baltic question and after three hours of all-party debate unanimously adopted sanctions against the Soviet Union. No other parliament in the world took such a decisive step. In late August 2001 after the putsch in Moscow collapsed, Canada was one of the first countries to recognize the newly restored independence of the Baltic states. LNAK President Zariņš and Dambergs joined an official Canadian delegation headed by senior Cabinet Minister Michael Wilson on a whirlwind tour that took them to Vilnius, Rīga and Tallinn to witness signing of the renewal of diplomatic relations with Canada. In the 1990s the Toronto community shifted its support for Latvia from the political realm to include broad-based humanitarian aid efforts, shipping a large number of containers with medical equipment, supplies, clothes and even food to Latvian hospitals, old-age homes, schools and orphanages. These efforts were lead by Alberts Upeslācis, Jānis Lūsis, Arvēds Celms, Bruno Logins, Inga Zariņš, Kaspars Tūters, Silvija Janušons and others. Following Latvia’s renewal of independence, former LNAK President Siliņš moved to Ottawa and was appointed honourary consul general before Latvia established a full-time diplomatic mission. Eduards Upenieks served as honorary consul in Toronto during the 1970s and 1980s. Mārcis Ešmits filled that role between 2001-2003. He was followed by Imants Purvs. Former LNAK activist Eichmanis became chief of staff to Latvian President Guntis Ulmanis after which he moved on to Latvia’s diplomatic service, first as counselor in Washington during Latvia’s drive to join the NATO defense alliance and then as ambassador in Athens. He was then appointed Latvia’s ambassador to NATO in Brussels. A new phenomenon for the Toronto Latvian community is the influx of recent immigrants from Latvia. Said to number more than 200, they are predominantly young and include students and nannies as well as families. Among recent arrivals are women but only a few men who have married local Latvians or even Canadians. Some are visible and active in the Latvian community. Most tend to stay on the periphery. Their situation is not helped by many older Latvians who view the newcomers with distrust and question their motives coming to Canada. Immigrants from Latvia also include non-Latvians who become part of the Russian community in the Toronto area. Today, like other Latvian communities in the West, Toronto is struggling to redefine itself to ensure that it can survive and continue to meet the needs of its members. Unlike other Latvian communities, its size and assets ensure that Toronto will be a viable community longer than others. At the link below, the dates got a bit mixed up. My understanding and that of most people is that the Soviet Union collapsed at the end of 1991 not 2001. lSomebody please clean this article up from the obvious “typos”, as it is its incompetent, misleading and an embarassment. Is this what our Baltic diaspora community has come to? I have an Estonian background but our history is identical and our future here is just as precarious and I fully expect that the Toronto Estonians will be joining the Lativians shortly after they have sold their house. I would like to have a Latvian speaking contact who lives in the Kitchener area who can help me with my step mother (currently living in Hamilton) who, some day, will be returning to Latvia. Izsmeļošs, informatīvs raksts! Dod ieskatu Kanādas latviešu dzīvē.